With Cloud Path, a new high score game for Android and iOS has been published. Such games are enjoying because of their entertaining game principle especially on popular mobile devices. Now Publisher Ketchapp has released Cloud Path a new game of this genre for Android in the Google Play Store and in the iTunes App Store for iPhone and iPad. Once again, the app comes with a completely new control system. In order to achieve a highscore here especially good concentration is necessary. Highscore games are normally simple: Try to survive as long as possible but at the first mistake you’re out. It’s the same with Cloud Path, because to continue after an error can not be done here. Even not with the premium currency, we find that very good, so you can compare highscores with your friends very well. But what do you have to do in Cloud Path? You control a square block here and have two control options. You are touching on the right side of the display so this is a step forward. You are touching on the left, the bird jumps to the next block. Although the direction of the blocks varies continuously, you do not have to pay attention. It is in cloud Path so just about to jump up the steps and otherwise just to tap on the right. However, you will find out quickly that it sounds much easier than it is in reality. So you do not need only a high concentration also a good speed. The further you get, the faster the blocks fall down behind you as well, so you have to tap faster and then the most common mistakes emerge in the game Cloud Path. On your way you collect Gems from time to time. These are required to unlock additional characters. If that’s not going fast enough, you can also pick up the in-app purchase and to unlock new characters faster. What appears simple at first glance, then turns out to be extremely difficult. 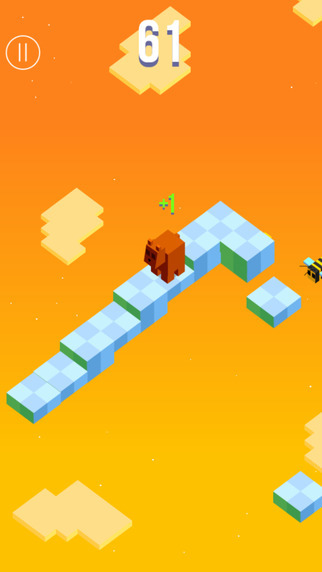 Cloud Path is a game in which a high concentration and speed is necessary to set a new highscore. The app for Android / iOS therefore is ideal for in between, if you a few moments. The unlock of new game characters using gemstones also greatly stimulates the long-term motivation. Subsequently, the download links for iOS and Android. The iTunes App Store to install the game at least iOS 5.1.1 is required. Cloud Path can be installed on iPhone, iPad and iPod. Cloud Path is free and available for download from the Google Play Store. Here, the app comes at a rating of 4.4 stars. To install the game Android 2.2 or higher is required. Be the first to comment on "Cloud Path: New highscore game for Android / iOS"